The cast of For The Last Time. Photo by Russ Rowland. 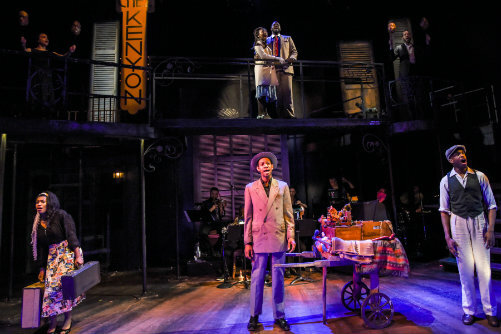 BOTTOM LINE: Taking a note from Nathaniel Hawthorne's The Marble Faun, this new jazz musical uses the sweet and sour notes of the trumpet to tell an unknown New Orleans tale. Welcome to New Orleans, 1950: the cast iron gates and above-ground cemeteries await; artists and hustlers bustle through the streets with high ambition, but also deep secrets. Nancy Harrow and Will Pomerantz’s new musical For The Last Time tackles such issues as love, loss, devotion, and death during Mardi Gras. The show follows a troubled but talented artist Miriam (Brittany Campbell), a recent transplant from Chicago. She seems to have been a success there until an unclear event cast dark shadows over her experience, forcing her to mosey on. In New Orleans Miriam tries to forget her sorrow by painting and going to museums and taking up with a young club owner named Kenyon (Carl Clemons-Hopkins). Merriment is plentiful even as her cousin Hilda (Anita Welch), the sheltered and stodgy writer, comes to stay. On a trek to the museum, with Hilda, Kenyon, and his pal, the naive country trumpet player Donatello (Britton Smith), a shadow emerges from Miriam’s past, turning her Eden into a wasteland. The three friends attempt to help Miriam heal in various ways, managing to get themselves caught in the situation both for good and ill. The musical’s charm is really in the music and its layered location. New Orleans’ mystery and history are a character, albeit a silent one, but the show transforms this friend into a menacing cage. The city, once thought to be conquerable, turns into a labyrinth where Miriam’s past looms around the corner like a minotaur. This reality is intentional as the play sensuously moves between ancient references and modern elements. The story, inspired by Nathaniel Hawthorne’s The Marble Faun, uses these seven Black characters to represent various tropes in fresh ways; new characters for an old canon. Harrow’s brilliant ability to place jazz into a classical structure is oftentimes inspired. The moment Miriam tells Donatello that he is the marble faun, a light bulb goes off. Accompanied by that light bulb is a strong trumpet note. This kind of interplay is replete throughout the show. For The Last Time takes its power from other transformative pieces like Hammerstein’s Carmen Jones or the Caribbean-French drama Black Orpheus, essentially classical stories with darker faces. Just like these two gems, For The Last Time uses music in a wonderful way from production tricks to musical theatre numbers. During Kenyon’s club opening he and Donatello step and play, but through some sleight of hand we never see the real trumpet player filling in for Smith, who plays Donatello with unique earthiness and stars in his eyes. During Hilda’s number “Little Girl, Big World” I was overcome by the strength of Welch’s soprano. It is a powerful and drastic change for the character in a show with so few character shifts, unfortunately. Still, the band behind each number is definitely high quality. The all-Black cast, it’s important to note, varies our ideas of Blacks in the 1950s. I think the metropolitan laissez-faire attitude of N’awlins adds to the characters’ sense of diversity, but I also applaud Harrow and Pomerantz for leaving out tired idioms from their book. You’ll find more thought and less drawl in this show, which is a step in the right direction. There are places the play’s action drags and plot holes do arise, but if you’re used to gothic, romantic novels you might just be fine. The actors do a good job of filling the space, but there is a gnawing feeling that something’s missing. Campbell’s Miriam reminds me of Diana Ross’s Lady Day, a powerfully fatigued and sometimes ornery creature who will greatly interest you, but I wondered: does she ever wake up? Welch’s Hilda is very even until her brazen solo, but by that time it seems too late. Smith’s Donatello is very satisfying, but when he crumbles under new pressure I wanted to really see a rift in his marble. Clemons-Hopkins is a great bari-tenor as Kenyon, but he too keeps it even with his fun loving businessman until the last possible moment. Reggie D. White's mysterious Overseer/Teacher takes on a sphinx, with his confusing riddles, but doesn’t sustain as a true puppet-master or spirit storyteller. In this musical set between the prep and aftermath of America's rowdiest carnival, I was surprised how quiet the piece seems. I loved the Jazz and the intelligent allusions to Hawthorne’s story, but those two things didn’t always listen to each other. The one thing missing from the show is its spontaneity and rare, “caught” moments that represent Jazz. As Donatello says to Miriam, and I paraphrase, there is no wrong note, but it’s the next note which makes the [musical] good or bad. This is still a show worth seeing for its exuberant use of music, its beautiful orchestrations by Dennis Mackrel, John McDermott’s layered set, and lastly, its intention of storytelling. It truly is a new show for an old canon. Although it doesn’t quite knock it out of the park, the musical gives you a pleasurable evening in the bayou.